“Restoration” in Thailand generally means dropping a Toyota Corolla engine and gearbox into something which might even be 30 years old, if it is lucky. However, restoration, as a craft, is common overseas, in which the entire vehicle is painstakingly returned to showroom condition, even if the car originally left the showrooms 80, or even 100 years ago. Don’t get me wrong, this can happen in Thailand, but it is not common. One of the favored cars for restoration in the US is the Model A Ford. Launched in America during December 1927, on the back of one of the biggest advertising campaigns the world had ever seen, the Ford Model A was an outstanding automotive success, with more than five million built by the time production ceased. Even today, it is regarded as one of the most popular collector cars in the world, some half a million thought to have been restored, customized and preserved in the US, although very rare in this country. The Model A was introduced as the successor to the previous Model T and differed entirely in styling and engineering from its predecessor, with a choice of 50 body styles and 40 paintwork colors, but not initially black. It was the first Ford to use a conventional set of control pedals, with three-speed sliding gear transmission, and featured hydraulic shock absorbers and welded steel-spoke wheels. The Model A featured here is owned by John Falder, MD of Manchester paint manufacturer HMG Paints, and holds a special place in the history of the company and the city itself. Dating back to September 1930, it is amongst the last Model A’s to have been built at Ford’s Trafford Park, Manchester plant, before production was transferred to Dagenham. The painstaking restoration work, which involved manually rebuilding virtually every pressed steel panel, was undertaken by Macclesfield coachbuilder, Norman Isles, who first met John thirty years ago and uses HMG cellulose finishes when refinishing such classic marques as Rolls Royce, Bentley, Aston Martin, Ferrari and Porsche. The second of three generations of panel beaters and restorers, Norman worked with his sons Craig and Simon on the Model A over a number of years, a job that he describes as one of the most challenging ever. 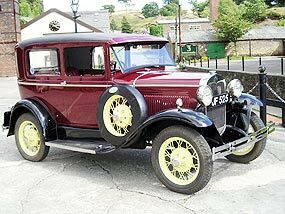 Registered on 27th September 1930, John Falder’s Model A, a 2-door Tudor Sedan, was thus one of the last Manchester-built models, featuring a different 2 liter engine to the US 201 cubic inch (3.3 liter) unit. The Falder family bought JF 525 in 1978 - in a very poor state, but with a complete history - and ran the car for around twenty years, adding a further 20,000 miles before pensioning off the venerable Ford. Later, HMG’s semi-retired maintenance manager, Tommy Wright, worked scrupulously on refurbishing the vehicle’s chassis at the Collyhurst Road factory, but sadly passed away before completing the job, so this professional restoration is also regarded as ‘Tommy’s legacy’. At first sight, the Model A appeared to be in sound condition, but when Norman Isles burned away layer upon layer of paint, there was precious little steel remaining. The original body panels were pressed on large machines, but Norman and his sons had to replicate every surface and swathe line by hand. It also meant working in an unfamiliar material, since most of the classic Rolls, Bentleys, Astons, Ferraris, even a replica James Dean Porsche 550 Spyder, they have restored, involved aluminium bodywork. The frame for the roof and windscreen was made from comb-jointed timber, again fully repaired and re-glued, while the composite roof was rebuilt to original specification from wood, wire netting, hessian and vinyl. Replacement parts were sourced from America and the steel spoke wheels were rebuilt and refinished in their original bright yellow finish. Although the cost of restoration work is likely to exceed the vehicle’s actual worth, it is restoration of history, and if it were not for enthusiasts like John Falder, these older cars would disappear. “Why do I concourse, instead of pit-crewing it? Why polish and paint and keep screwing and gluing it? And loving and hating and laughing and rueing it? Last week I asked which famous marque began by building tractors from war surplus Morris, Ford and GM bits and pieces? That was really too easy - it was of course Lamborghini. So to this week, and it has been something of a Ford week. So, here’s a Ford question. At what university did Henry Ford 1 study engineering? Fiesta - when will we get it? With the news that the slow-down in the world economy has slowed vehicle production in Thailand, as we are a major exporter, will this set the release of the new Ford Fiesta back? My information would lead me to believe that this will be the case. Instead of a late 2009 roll-out from the AAT plant in the Eastern Seaboard Industrial Estate, the mutterings are now for 2010. Never mind Ford’s predicaments, this has given me one as well. With over 150,000 clicks on the mighty Mira, will it last until 2010? I was prepared to nurse it through till 2009, but now? 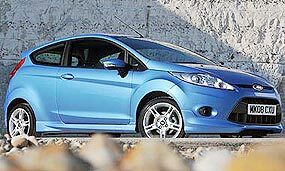 With Ford looking currently the strongest in the financially cash-strapped US Big 3, the Fiesta is an important product for the blue oval, which can in turn bring FoMoCo back to its dominant position it once held. So far, all the reviews from overseas are very positive, making the new Fiesta sound very desirable. Well designed, adequate performance for a small car, and having seen one in the UK recently, it looks a stunner. When the Fiesta goes on sale in Australia it will initially be imported from Germany, but a year later the Aussie Fiestas will come from Thailand, where they will be built alongside the Mazda2 and take advantage of a free trade agreement that eliminates the 10 percent tariff applied to most vehicle imports. Come on Ford! Build ‘em. I’m waiting. Is ability in motor racing inherited? With three young drivers in F1 in 2008, two of whose fathers were world champions and the remaining one the most successful his Asian country had ever produced, it would seem that genetics is important. But is it ‘nature’ or ‘nurture’? Let’s look at these drivers. The Asian face is the second driver at Williams F1. For Nakajima, he has the legend of his father Satoru Nakajima to contend with. Although Satoru scored just 16 points from his 74 Grand Prix starts, he is widely regarded as one of the founding fathers of F1 racing in Japan. Unlike his son, who made his Formula One race debut at the age of 22, Satoru was a comparatively late entrant to the sport, and he was 34 years old when he scored his first full-time race seat alongside Ayrton Senna at Lotus in 1987. Yes, Ayrton Senna. Nakajima Senior was not totally overshadowed by his illustrious team mate and he recorded some impressive results, including fourth place at the British Grand Prix, and he was retained by Lotus for a second year. With Senna departing in 1988 the Japanese driver found himself paired with Nelson Piquet (Senior), who had just won the third of his world titles. Both Nakajima and Piquet would race for a further two seasons, but while Piquet would add three more victories to his tally, for Nakajima it marked the beginning of the end of his F1 career. The Japanese driver eventually returned home and began to nurture the careers of several younger driving talents, including that of his son Kazuki. Kazuki served his apprenticeship and over the past few years has made steady progress up the ranks, winning some of the lesser series, a few runners-up, many wins and even more podiums. He ended up in GP2’s 2007 season third in the standings and rookie of the year. He had performed well enough that when Alexander Wurz announced his premature retirement from racing with one round left to run in 2007, Nakajima was picked to fill the Austrian’s seat at the Brazilian Grand Prix. Although he made the headlines for running over his pit crew, his debut went well enough to secure the seat full-time for 2008. During testing he recorded times equal to his more experienced team mate Nico Rosberg, another driver the son of his famous father world champion Keke Rosberg, a wild and exciting driver to watch! 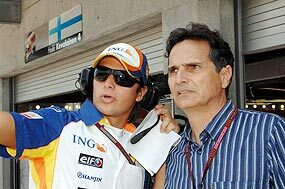 The grid for 2008 had even more sons of fathers, with the second seat at Renault being filled by Nelsinho Piquet Jr, a young man who also has rather large shoes to fill - his father’s. Back in the late eighties, his father - and namesake - was one of the most celebrated drivers in the sport. A three times world champion by the age of 35, the Brazilian enjoyed 23 race wins during a Formula One career that lasted over 14 years. However, is he only trading on his family name? Up until 2008, Nelsinho Piquet Jr had won two Formula Three series - one in his native South America and the other in Britain - and in 2006 impressed in GP2, winning four races and finishing runner-up to Lewis Hamilton. During 2007, the 22 year old was behind the wheel of a Formula One car, completing over 8,000 kilometers for Renault as test driver. But alongside ex-World Champion Alonso in 2008, young Piquet did not excel (as opposed to what Lewis Hamilton did at McLaren in 2007, beating the sulky Spaniard many times). Interestingly, Piquet’s father also got his first race seat alongside triple world champion Niki Lauda. So with Nakajima, Rosberg and Piquet, does this prove that talent behind the wheel is hereditary? Unfortunately, through personal experience, I believe it is not. Nakajima, Rosberg and Piquet grew up in a motor racing environment and that is why they would to attempt to follow their fathers. My eldest son, the progeny of myself and my first wife, both of us drivers for an international Works Team, was raised away from the smell of racing fuel and has neither interest, nor the talent! So much for genetics!